I am quite sure if you were to ask the vast majority of the British public to name five car manufacturers, none of them would even dream of mentioning Infiniti. But ask the very same question in the States and I am sure quite a lot of people would mention them. When you consider the brand was originally launched 25 years ago they really do not have any brand awareness in the UK at all. In a valiant attempt to take on the Germans at their own game, Nissan, Toyota and Honda all launched premium brands. As I have mentioned before, in America they have managed to outsell their competitors by making their cars not only look great but jam pack them with technology, with the trump card being the car’s excellent reliability. Infiniti was originally launched in Europe about eight years ago when they introduced the Q45 which looked very nice. This smart looking car didn’t put Infiniti on the map but now they are here with a bang, thanks to clever F1 sponsorship with the Red Bull team. They are also looking to enter a car into the BBTC. They have invested heavily into designing all of the dealerships to look amazing. As soon as you walk into the showroom the place just screams quality. And thankfully, for a change, Infiniti have chosen our very own local super group Vertu to lead the charge in spreading the word about this company. The new Q30 is the car to put Infiniti on the map, and best of all it is being built in Sunderland at the Nissan plant. The staff have been retrained in how to build a premium car that is firmly aimed at the BMW 1 series, Mercedes A Class and the Audi A3. This car looks very smart indeed and you can’t help but think it’s a small SUV. 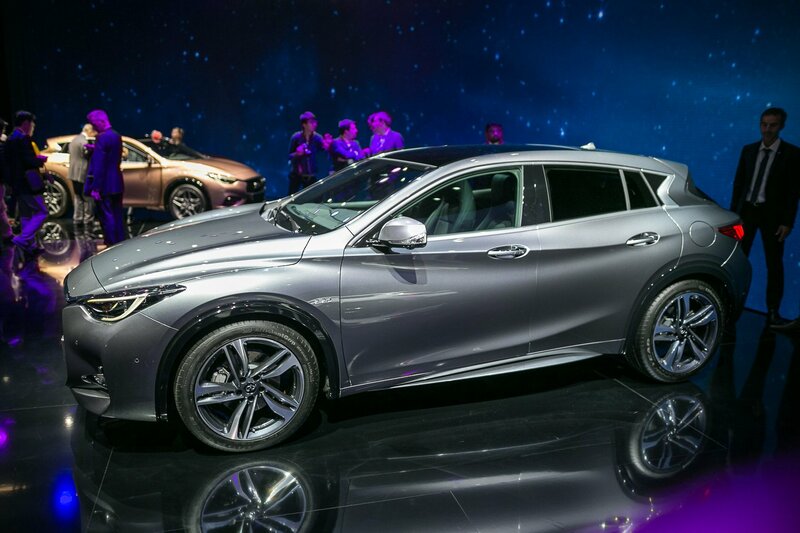 Infiniti are launching a Q30 SUV next year called the QX30. In the right colour with the right wheels, this car looks simply amazingly. The cars suspension and engines come courtesy of Mercedes. We therefore have a Japanese car that is built in Sunderland with essential German components. The car’s doors have a real reassuring German sounding thunk and the team at Sunderland have really excelled themselves with the build quality. When you step inside the car the soft touch materials really ooze quality. The car’s cool interior makes a nice change to its competitors quite boring looking interiors. The Infiniti’s infotainment system is all controlled via an iDrive style controller which if I am being honest, isn’t as good as its competitors versions. Infiniti have used the Mercedes parts bin to the max, it has to be said this is not a bad thing at all. The best-selling car in the range is likely to be the 1.5lt Diesel engine which has been sourced from Renault. The other two engines are supplied by guess who! Yes you’re right, they are supplied by Mercedes and it may not surprise you to know the dual clutch gearbox is also courtesy of Mercedes. A manual gearbox is available with smaller engines and larger engines get the option of four wheel drive. The car available in three trim levels. The entry car is the SE, followed by the Premium and the range topping trim, the Sport. In this guise the car gets lower and stiffer suspension and much more aggressive looking bumpers. The car’s steering is also weighted to give the driver a much sportier feel. 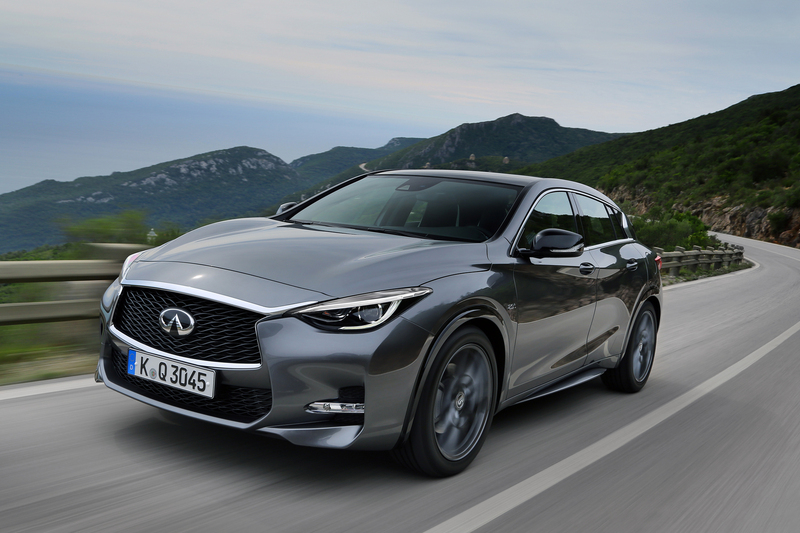 To try and address this noise and refinement issue the engineers at Infiniti have attempted to alter the acoustics by using noise cancelling technology. I can honestly say the 1.5lt diesel I drove was very noisy and maybe the noise cancelling technology wasn’t working at all though it was very economical even with my lead right foot. The car has sufficient poke to overtake and the power is delivered in a seamless manner. The car’s trump card is its fantastic handling. The suspension keeps the passengers extremely well cushioned from our terrible roads and whenever you feel like driving the car in a sporty manner it really steps up to the plate and it doesn’t disappoint at all. At speed the car really suffers from excessive wind and tyre noise and unfortunately not even the boffins at Infiniti have managed to solve these issues. The 1.5lt engine really needs to be worked hard to make any real progress while the 2.0lt petrol engine is slightly sportier. The car is priced from £20,550 with the range topping car costing £27,300. Passengers have plenty of headroom and the boot is also a decent size for most growing families. This car will definitely put Infiniti on the map but it doesn’t quite beat the class leading Audi A3. Anyone looking for something slightly more different to the boring German competitors should head on down to our local Infiniti dealership. I am sure Jeff and his great team will look after any potential customers. Anyone who saw me driving the understated blue chrome wrapped car will be devastated to know it’s been sold, but you could always get a gold wrapped car which seems to be the latest craze in the Middle East!